The thoracic wall is composed of skeletal parts and muscles. Posteriorly, it’s created from twelve thoracic vertebrae and their intervening intervertebral discs. Laterally, the wall is composed by ribs (twelve on every side) and 3 layers of flat muscles, which span the inter costal spaces between adjacent ribs, move the ribs, and supply support for the intercostal spaces. Anteriorly, the wall is created from the sternum, which is composed of the manubrium of sternum, body of sternum, and xiphoid process. The manubrium of sternum is posteriorly casted on the body of sternum at the manubriosternal joint creating the sternal angle. The clinicians have utilized major surface landmark while physically examining of the thorax. The anterior (distal) end of every rib consists of costal cartilage, which leads to the freedom and elasticity of the wall. All ribs joint with thoracic vertebrae posteriorly. Most ribs (from rib II to IX) have 3 joints with the vertebral column. The head of every rib articulates with the body of its own vertebra and together with the body of the vertebra above. As these ribs arch posteriorly, every also articulates with all the transverse process of its vertebra. Anteriorly, the costal cartilages of ribs I to VII articulate together with the sternum. The costal cartilages of ribs VIII to X joint with the inferior margins of the costal cartilages above them. Ribs XI and XII are named floating ribs because they don’t articulate with other ribs, costal cartilages, or the sternum. Their costal cartilages are small, only covering their tips. The skeletal framework of the thoracic wall gives extensive connection sites for muscles of the neck, abdomen, back, and upper limbs. A number of these muscles connect to ribs and function as accessory respiratory muscles; some of them also stabilize the position of the first and last ribs. Entirely encircled by skeletal components, the superior thoracic aperture is composed of the body of vertebra TI posteriorly, the medial margin of rib I on every side, and the manubrium anteriorly. The superior margin of the manubrium is in roughly the same horizontal plane as the intervertebral disc between vertebrae TII and TIIl. The very first ribs slope inferiorly from their posterior articulation with vertebra TI to their anterior connection to the manubrium. Therefore, the plane of the superior thoracic aperture is at an oblique angle, facing somewhat anteriorly. 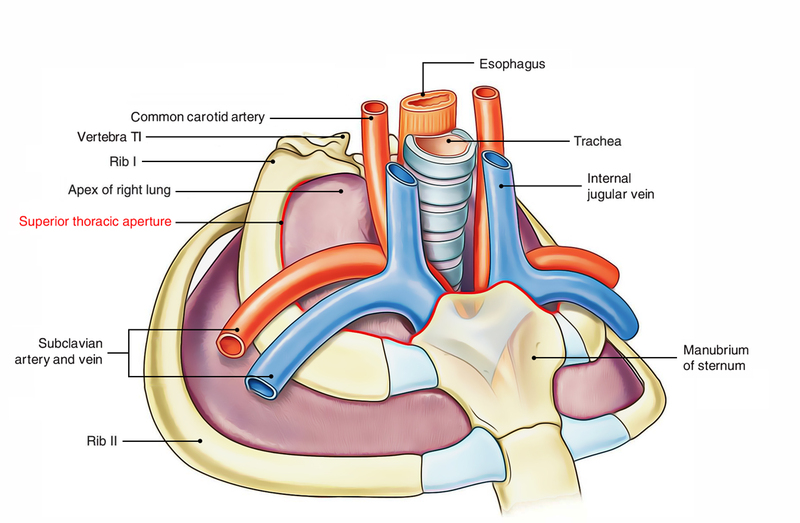 At the superior thoracic aperture, the superior aspects of the pleural cavities, which surround the lungs, is located on either side of the entry to the mediastinum. Structures that pass between the upper limb and thorax pass over rib I and the superior part of the pleural cavity as they goes into and leave the mediastinum. 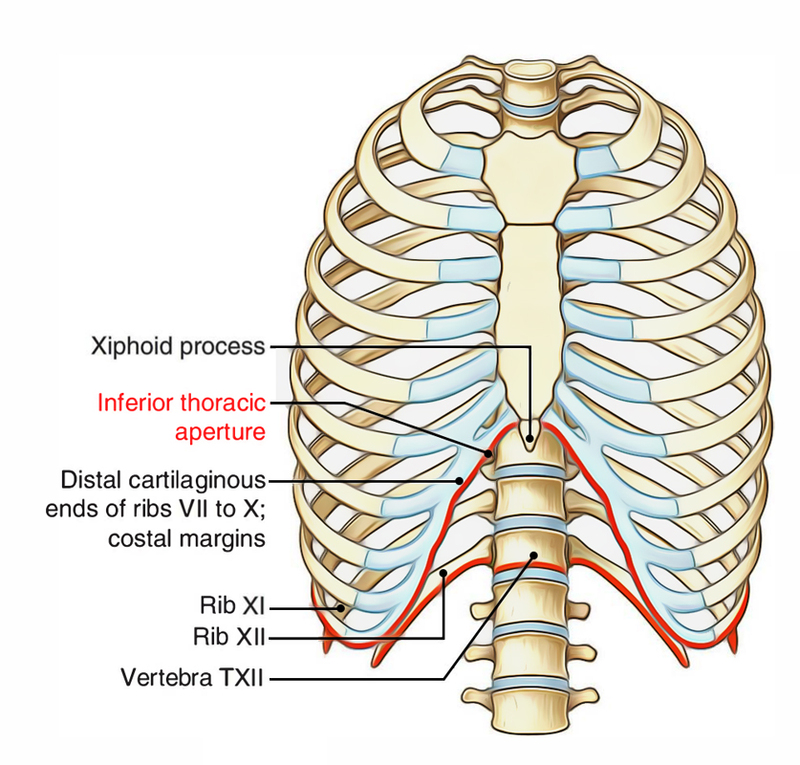 Structures that pass between the neck and head and the thorax pass more vertically via the superior thoracic aperture. The inferior thoracic aperture is large and expandable. Bone, cartilage, and ligaments create its margin. The inferior thoracic aperture is closed by the diaphragm, and structures passing between the abdomen and thorax pierce or pass posteriorly to the diaphragm. The body of vertebra TXII posteriorly. Rib XII and the distal end of rib XI posterolaterally. The distal cartilaginous ends of ribs VII to X, which unite to create the costal margin anterolaterally. The joint between the costal margin and sternum is located about in exactly the same horizontal plane as the intervertebral disc between vertebrae TIX and TX. To put it differently, the posterior margin of the inferior thoracic aperture is inferior to the anterior margin. When viewed anteriorly, the inferior thoracic aperture is tipped superiorly.